Description: In 1804, an expedition led by Meriwether Lewis and William Clark departed Camp Wood, Illinois, on a journey to discover the source of the great Missouri River and map a path to the Pacific Ocean. Traveling by canoe, on horseback, and on foot, the Corps of Discovery completed its mission successfully, returning safely to St. Louis, Missouri, in 1806. 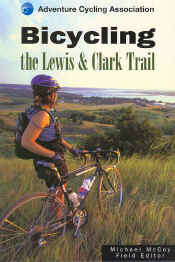 Bicycling the Lewis & Clark Trail is the cyclist's indispensable handbook to the route of the Lewis and Clark expedition. Filled with detailed maps, information on road surfaces and traffic, and a wealth of historical detail, it guides the modern adventurer through the spectacular country first recorded by Lewis and Clark. Retrace Meriwether Lewis and William Clark's historic expedition from the saddle of the ultimate touring machine - your bicycle. From Hartford, Illinois (outside St. Louis) to Astoria, Oregon, at the mouth of the Columbia River, the Lewis & Clark Trail passes through eleven states and winds more than 3,200 miles. As it traverses the Missouri and Columbia river basins, the trail skirts corn and wheat fields, rolls across high prairie, descends into deep gorges, and penetrates Pacific Northwest rain forest. And all along the way, there are reminders of the Corps of Discovery's epic journey. Bicycling the Lewis & Clark Trail is a collaborative effort by outdoor and travel writer Michael McCoy, cycling photographer Dennis Coello, and the Adventure Cycling Association. With this guide the staff of Adventure Cycling's Routes and Mapping Department share their route-finding and cartographic skills with anyone ready to pack their panniers, climb in the saddle, and aim their bicycle westward. Inside you'll discover: forty daily ride sections ranging from 45 to 113 miles in length, each with a route map and mileage log; details on each section of the ride, including riding conditions, terrain, and distance; vivid descriptions of attractions and other points of interest; more than fifty scenic color and black-and-white photographs. Whether you're an experienced bicycle tourist or someone looking for a new way to explore history, this guide will give you the information you need to take on the challenge of cycling the Lewis & Clark Trail.